Life was simple when I grew up. We weren't rich but I didn't realize it. I was content to have one good party dress and hand-me-downs from my sister. I loved my mother's choice of dotted swiss, eyelet, and organdy dress fabrics. This card was my effort to capture that sweet, simple time of my youth and to thank my mother for dressing me in girly-girl clothes. 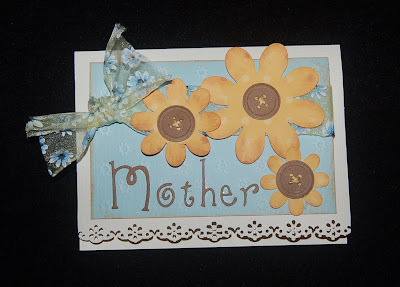 The flowers were cut using a Sizzix die and the texture of the blue paper was impressed with a Sizzix texture plate. DCVW blue cardstock (with a white core) was used and then sanded after impressing to highlight the design. The eyelet edge was punched on an American Crafts cream heavy card blank (trimmed a bit) that comes in a pack with envelopes. The buttons are punched out of brown cardstock and yellow embroidery floss was tied on. 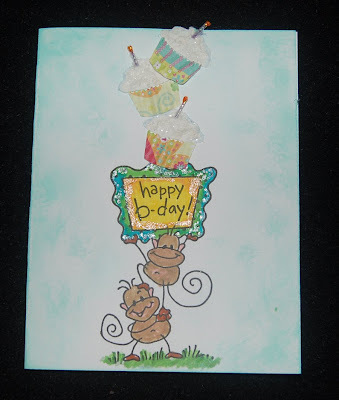 Wanting to use this new Martha Stewart button punch was actually the start of this card design. Tea dye Ranger distress ink was lightly applied to the edges of the blue rectangle and the flower petals. I will write up this project on the Ben Franklin Crafts website (http://www.bfcraftclub.com/) if time allows. Thanks for visiting this blog site. This is another album page gift bag (like the project shown on the Ben Franklin Crafts website, http://www.bfcraftclub.com/ ). 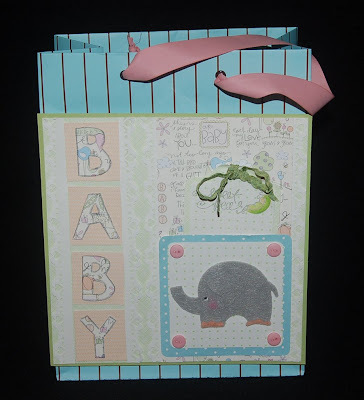 I wanted to show you that you can make an album page and use it to decorate a gift bag. The gift in the bag could be an album which would be appropriate and give the recipient somewhere to put the page (pop-dots make it removable from the bag). Not obvious from this photo is the fact that the green rick rack is attached to a tag which is in a pocket behind the elephant. The elephant is cut (Sizzix die) out of grey felt. The scalloped heart strips were made from computer paper (recycle those misprinted sheets) using a Fiskars paper edge punch. Photos can be attached to the tag or placed in the pocket. Yesterday I had the pleasure of meeting Cheryl Miyashiro at the Hilo Ben Franklin Crafts make-it-take-it. She showed customers the cutest little projects and had lots of sweet samples of what can be created with Sizzix Hello Kitty die cutters. If you ever have a chance at attend a demo by Cheryl, don't miss it. Cheryl is just as sweet as her work. I was inspired by what I saw and I'll be working on some projects using the new Sizzix products I purchased as well as the complimentary freebies I received. Thanks Cheryl, and keep making your beautiful creations! I love it when I discover a new use for a tool I already have. This may not be a new idea to some of you clever crafters out there, but I discovered it accidentally. I saw a new product, crinkled beading wire for jewelry makers, and I thought it was cool. Then I had a light bulb moment and decided that I could make it with a paper crimper and plated beading wire. Use one hand to guide the wire straight into the crimping tool and turn the crank with your other hand. 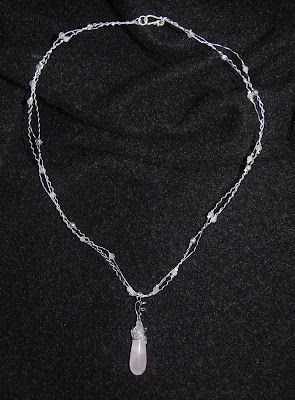 The photo shows what I made with the crimped beading wire. Instructions for the project will appear in the online newsletter section of our craft club website (http://www.bfcraftclub.com/) by next week, hopefully. Tomorrow I will try to get to the demo at Ben Franklin Crafts in Hilo. I'm hoping to see what Cheryl Miyashiro (Hero Arts and Sizzix) will be demonstrating. I love her work and her blog, 'Life is Sweet'. I am still trying to figure out how to link you to my favorite blog sites so you can have fun reading and learning from them too. Thanks Cheryl for the positive comment about my last cupcake card. I'm still punching out cupcakes. I sort and store the extra punched pieces in mini-ziplocs for times when I need a quick card. I realized this morning that I needed a card for a nephew whose birthday is in a few days. The Changito monkey stamps by Stampendous are lively and amusing like my nephew so it was an easy stamp choice. The cupcakes on this card were made like the ones on the last card except the paper cupcake liners were punched from printed paper scraps. Punching small shapes is an excellent way to use up all those too-good-to-waste little pieces of scrapbook paper. The card was colored with Martha Stewart marking pens. They are juicy so you should use a thick card blank or double layer your card. I also used MS glitter pens to add a bit of shine to the framed sign. I had to think hard about how to make the candles and finally decided on irridescent cording. I placed snippets of cording on a non-stick surface (silicon mat) and put dabs of orange Stickles on the tips of the cord pieces. It was difficult to make a not-too-girly birthday card. (I really wanted to use pink glitter for the frosting.) I hope my nephew is happy to have his day remembered and not repulsed by the cutesy monkeys. I am so happy that I finally found and purchased a Martha Stewart cupcake paper punch! It was the last one at the Hilo Ben Franklin Crafts store. I'm sure there will be more available soon. Anyway, the punch inspired me to design this birthday card. It's not obvious from this photo but I am proud that I found just the right paper to use for the cupcake frosting. The thick cream colored mulberry paper from Mountain Idea Co. (sold at BFC) really gives a texture that looks like swirled frosting. After punching out the cupcake frosting shape I applied a thin coat of white glue and sprinkled the frosting with fine white crystal glitter (MS). For the cupcake paper I used a paper crimper after punching out the shape. The large scalloped circle is a rubber stamp design from Hero Arts as is the rubber stamp for the word 'delight' (part of a set). 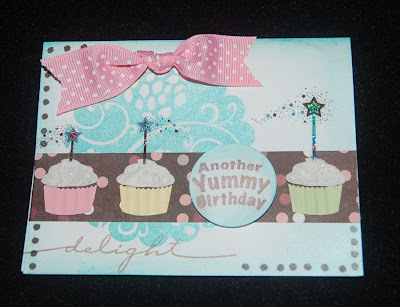 The words, 'Another Yummy Birthday' is from a Studio G mini set. The sparkling wands are stickers from Mrs. Grossman. I have another idea for using the cupcake punch and I'll try it tomorrow. The new gemstone focal beads from 'Imagine It' are beautiful and reasonably priced. Each large semi-precious stone is mounted individually on a card to showcase its uniqueness and design possibilities. 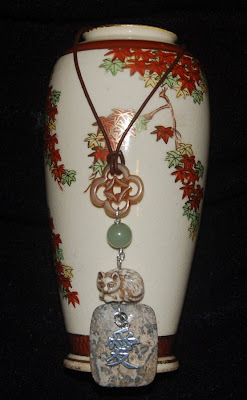 The large-hole, rectangular, neutral-colored pendant bead in the photo seemed to suggest an Asian look. Because most Asian designs have simple lines, I decided keep the construction of this necklace minimalistic. I used sterling silver wire and simple wire wrapping. For the cording I chose Greek leather and added a cord crimp hook and eye. I'm not sure if the cat bead is available at BFC but I know that there are lots of other carved animal beads at the store. I think that you will also be inspired by the new line of Imagine It focal beads. I will probably write up this pendant project for the craft club website (http://www.bfcraftclub.com/) and definitely will continue to create unique jewelry with these exciting new beads. We just returned from Honolulu and Easter just hopped up on us. I guess I won't be writing a project write-up for the egg card but I hope that you could follow my brief instructions if you wanted to copy it. I've been busy baking hot crossed buns. This year I tried Martha Stewart's new recipe with cherries in it. It was just as good as her mother's original hot cross bun recipe and includes very similar ingredients. Both recipes are on the Martha Stewart website. Because the buns were going to a neighbor's dinner I wanted to make a fancy presentation. A recycled basket was easily decorated with tuile ribbon (comes on a roll and is usually used for weddings), lavendar paper twist ribbon, wired pastel garland, and a mini stuffed rabbit. 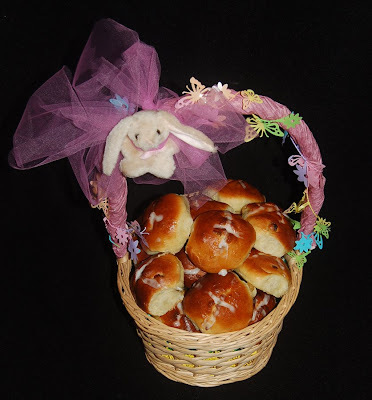 Oh, I filled the bottom of the basket with Easter grass and covered it with green plastic wrap to keep the buns clean. Have a Happy Crafty Easter! I don't know anyone who doesn't love cupcakes. I think my attraction to cupcakes is their petite size and the fact that you get a whole cake to yourself (unless you're forced to 'share'). Although I don't bake cupcakes too often, I got real excited when I saw the Wilton cake/cupcake carrier. 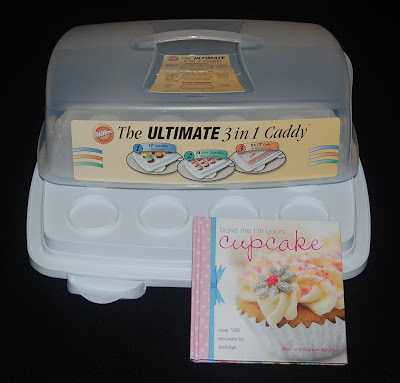 The carrier is cleverly designed to hold a sheet cake or two different sizes of cupcakes. The plastic container with a handle is intended for safe transportation of your baked goods. I can't wait for an opportunity to make and take cupcakes somewhere.....mmm-mm-mmm maybe this Easter! Also at Ben Franklin Crafts I found a sweet cupcake book, 'bake me I'm yours.... cupcake ' by Joan and Graham Belgrave. The beginning of this book has basic recipes and instructions for making tasty cupcakes but most of the book is devoted to decorating cupcakes that are almost too pretty to eat. If you are not much of a baker, you might want to make cupcakes from a mix and then just follow the decorating instructions from this book to make your cupcakes look like those from a specialty bakery. Spring is the season for flowers and the Sizzlet Flower Garden die cutter will give you lots of flower power. 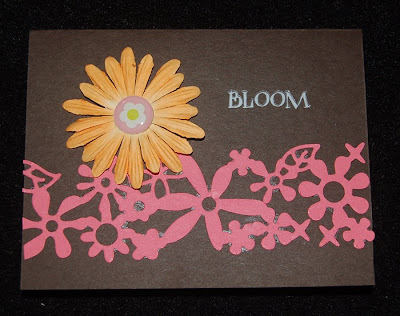 Both of these cards feature the lacy, intricate flower design cut from card stock. The Easter card eggs were made by running a segment of the die cut flower strip through a Xyron machine and sprinkling the sticky side with matching glitter. Next a contrasting piece of colored card stock was passed through the Xyron machine. Then the non-glittered side of the flower strip was adhered to the sticky side of the solid colored card stock piece. Glitter matching the card stock was sprinkled on the joined card stocks. 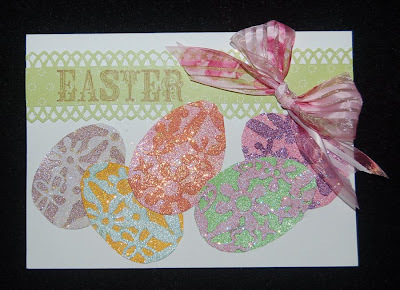 The twice glittered card stock was then cut into an egg shape. If I have the time (between the zillion other projects I have going on) I will write up the egg card (before Easter) and post it on the craft club website (www.bfcraftclub.com). Oh yes, the edge of the green strip on the Easter card was punched with the Martha Stewart lattice edge punch and the word 'Easter' was stamped using a Studio G dollar stamp. The large flower is from Prima and the flower brad is from Making Memories. The word 'Bloom' is a rub-on but any stamped message can be substituted. Well, I hope that you will spring into SPRING with the power of flowers. Have you noticed that recently many craft products have owls on them? Maybe it's the expressive large eyes but I simply cannot resist the owls. Hero Arts has a collection of owl stamps both clear and wooden handled. 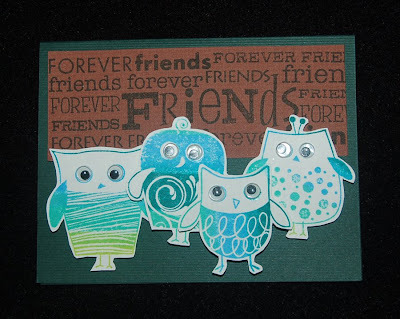 The four owl friends card pictured here was made with the wooden handled rubber stamp set and the large clear word stamp set with four card size stamps (friends forever, happy birthday, thank you, and live simple). A Kaleidacolor blue and green ink pad was used and googly eyes were glued on. The other owl card was made with Hero Arts clear stamp sets. The words yoo hoo and the flower rhinestone came from one set and the owl on a branch came from another. I just drew in the rest of the branch inside the card and stamped the word thank (from another stamp set). I used a scrap of printed paper with an abstract tree with leaves for the front of the card. 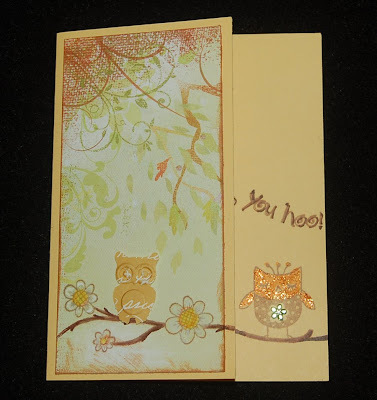 The owl on the front of the card was made using a super cute embossing owl punch (Martha Stewart) and printed paper. 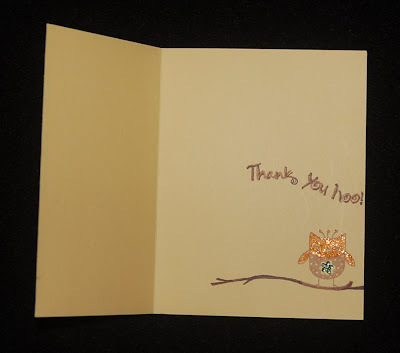 The flirty orange owl was embellished with Stickles glitter glue. I hope you'll have a hoot making owl cards and other owl crafts.